Hi friends! Today I am coming to you in the middle of a few time-sensitive projects I am working hard to finish, and I apologize if you have been wondering about the absence of the usual morning post because of it. Earlier this week I shared my recaps of the IDEA World Fitness BlogFest and IDEA World Fitness Convention I attended last week in Anaheim, California. If you have checked in even a little bit, then you know that I am extremely happy with the decision I made to find the means to attend the conference and now plan to go annually. I last left off recapping the end of the EXPO Saturday, and the remaining day and a half of classes were filled with tips in fitness writing for publications and websites (yes, please), tips for success in teaching group exercise and small group training (perfect), and two back-to-back basics of anatomy sessions on Sunday! Since I am still studying for my CPT through NASM, the conference and courses couldn’t have come at a better time. While I still plan to share the details and many, many tips I acquired in my sessions throughout the course of the conference over the next few weeks, I wanted to close out my recaps with some final photos paired with my DO’s and DON’Ts tips for attending IDEA in the future. A lot of you have expressed an interest in attending IDEA down the road, so I hope this helps in aiding your decision! • DO join the 12,000+ in signing up to attend the biggest conference for fitness professionals and enthusiasts if you fit into that category and want to expand your knowledge for yourself and/or business. I have already said it three times, but I can’t fully express my feelings coming home from this event by simply summarizing them into words. I am more inspired than I ever thought I could be pushed to be, and cannot wait to see what the next year of this transition out of dancing and into full-time fitness and blogging will lead me. Watch out, world! • DON’T wait until the last minute. After debating for months, I signed up with thirty days to spare and had to stay at a hotel off-site until my blogging buddies generously offered for me to crash in their rooms. Also, if you sign up early, you can take advantage of one or more discounts off of your admission ticket! We’re talking hundreds of dollars here. • DON’T get overwhelmed by scheduling your sessions online. I sure did. I didn’t even know where to start at home or once I arrived! I ended up spending hours going through my options and picked a draft of a schedule to at least have a base of classes I knew I was interested in. Realistically, most of the sessions labeled “full” end up having at least a couple of extra spots, if not more, and I only ended up attending two I previously signed up for. I showed up early and went on “standby” for the rest and got in every time! Once I showed up to registration and saw it all printed out on paper, everything became much easier to navigate. 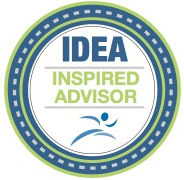 • DO download the IDEA Fitness Events app for your smartphone. I found out about this app after I picked up my registration packet and it proved to be extremely helpful! Here, I found a breakdown of each session as well as a biography of the instructor. I could easily check into a session and tweet about what I was doing while scrolling through a live feed of notes and pictures from fellow attendees. Also, I plan on going back through each of my sessions to rate and review them directly through this app. • DO sign up for the BlogFest ticket, if you are a blogger or are looking to start a blog. Meeting a tribe of healthy living and fitness bloggers who have the same passions and goals as you do is an amazing feeling. Over the course of two days, I learned a lot from fellow bloggers as well as speakers who work with bloggers leading the sessions. Photo credit: Whitney of Live and Diet in L.A.
Google searches save me when I have blogging questions, but it is refreshing to hear the tips in-person from those who have great successes in the world of blogging. • DO wear workout gear to all of your sessions. One advantage of the fitness industry (to me anyways) is a free pass to wear yoga pants, cute zip-ups and sneakers at all times of the day. IDEA, along with other fitness and blogging conferences I have attended like FitBloggin’, ovver a lot of workout sessions, and nobody cares about dressing up further than that in between the sweating. In fact, I brought an extra sports bra and top with me every day to change into after some of my sweatier sessions. Everyone comes dressed in fitness attire, and I even took advantage of this on Sunday when I didn’t even have workouts planned into my schedule. I brought a couple of dressier outfits (meaning street clothes like jeans and dresses) for outings at night, and always had a jacket to layer with during the day. Those conference rooms can get chilly! • DO sign up for a good balance of workout/non-workout sessions. I have heard from people who attended IDEA in previous years not to overload the workout sessions. I averaged two or three a day (tops) and made sure to have plenty of informative, sitting sessions in-between. Going forward, I will definitely stick to this type of schedule! • DON’T be afraid to step out of your comfort zone and get to know new people. It was nice for me to attend this conference with a group of blogging friends I already knew and loved spending time with. I did, however, also make an effort to talk to new people and bloggers in sessions and branched out on my own for a lot of them. Even if you feel silly, there is no harm in putting yourself out there. You never know who will be sitting next to you in a session (so glad this happened a few times, Pavey! ), and I have met blog readers as well as other interesting people in the healthy living industry by simply handing them one of my cards! • DO pack snacks and carry around a water bottle. While the EXPO does a great job of providing samples, there were definitely times where I wish I packed more substantial snacks with me. And there’s only so many protein bars you can enjoy in a row. Before the conference, a group of us walked over to Target and I brought home bananas, almond and fruit trail mix, baby food (seriously… don’t knock it as a pick-me-up snack until you try it! ), and gum to curb my hunger and keep me going through the longer sessions. I went through everything and was thankful to have brought them! • DO bring business cards with you. I already mentioned this above, but if you plan to attend a conference that can grow your business in any way, bring business cards with you! I made my own over a year ago by listing to my main contact information and media channels and included a picture of myself for brands to remember a face with the name via PicMonkey. I am still slightly embarrassed by them, but they sure came in handy when I was talking to a company contact or person interested in what I do! • DO fill out and turn in your CECs and CEUs forms! Your huh? Yeah, that’s what I said. Basically those are just fancy terms for recertification credits. By signing up for sessions (including some workouts!) you can continue your credentials with your certifications through courses offered at this conference. I’m still not one hundred percent sure of how to complete the process, but from what I understand, you fill out the sheet given to you with your courses and send it over to the company you earned your certification with! I plan on giving my friend Mike over at NASM a call to help me make sure I do it correctly. • DON’T be afraid to pitch yourself. I learned this one from my dear friend, Katy. If you are ever afraid of going up to a brand or booth at an EXPO and introducing yourself and what you do in hopes of gaining a partnership with them, don’t be. What is the worst that can happen… they say no? Then you are are in the same exact spot as you started. No harm, no foul. I tried to keep that piece of advice with me throughout the entire conference, and as a result, made a lot more connections that I would have without that type of thinking! Do you have any more questions about the IDEA World Fitness Convention or IDEA World Fitness BlogFest that I didn’t cover? Feel free to ask them below in the comments section. Like I mentioned above, I plan to go into a lot more detail about what I took away from specific sessions over the next couple of weeks. I don’t want to overload you with information, and want to make sure I get the right permissions to share notes from the speakers first, but keep a look out! Have a great rest of your Thursday, and I hope to see you there next year! Don’t worry, I’ve been meaning to get new ones for over a year now! But at least they’re something! Awesome! So glad you are enjoying reading them. And I hope to see you at one down the road! Thanks for the link girl! Wish we had gotten to meet. What a helpful recap. Next year I plan on following all of your rules! I know, wish I could have met you too! You did a wonderful job on the panel. I look forward to keep up with your blog and hopefully seeing you next year! Your photos are awesome, and I love the Do/Don’t component of your post! I definitely learned a lot along the do/don’t lines that I hope to share. It was my first blogging/fitness conference and I’m really glad I went!! Loved reading this, especially since this will be my first BlogFest. I’m so nervous/excited! Can’t wait to meet you, Heather! Woo hoo, excited to see you too! Hi Heather! Thanks for the great tips. I’m preparing to go to NASM Optima (I’m a new CPT) and had no idea what to expect at a fitness conference. Now I know I can pack my workout gear, and leave the business suits at home!! Hi Paula! I’ve never been to NASM Optima, but I would imagine it to be a similar format as IDEA. I hope you enjoy the conference!